Volleyball was the big draw at the Dalplex this past weekend as teams from the AUS and Quebec’s RSEQ met for their third interlock of the season. 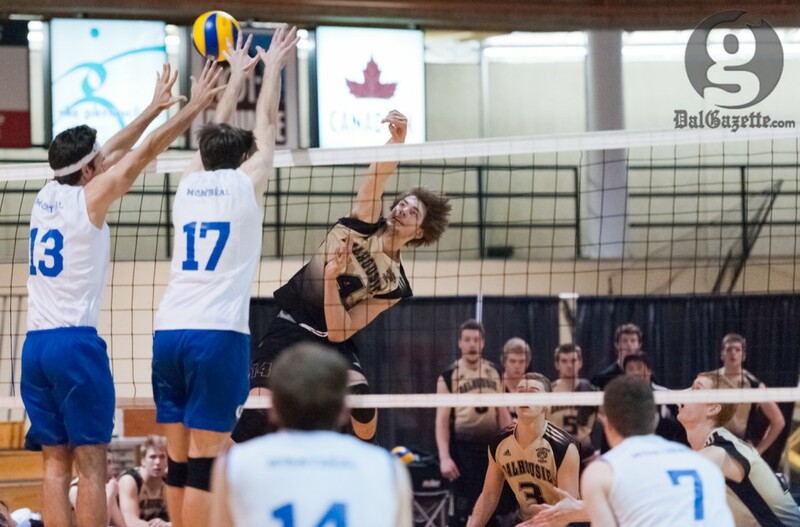 In a tightly contested series against Sherbrooke, Montreal and Laval, the Dalhousie men’s volleyball team held their own in winning two of three games. The first match was a battle of attrition, with both teams trading set victories en route to a deciding fifth set, where the Tigers outlasted Sherbrooke 15-9. Middle blocker Connor Maessen was instrumental in the win, coming up with key blocks and kills throughout the match. “We came in really focused on just getting the job done, doing what needs to be done to win,” said Maessen, who was awarded player of the game. The Tigers faced a quick turnaround, with two games scheduled the next day, but coach Ota felt confident in his team’s ability to remain competitive. The AUS-leading Tigers were forced to go the distance again Saturday afternoon, this time against Montreal. After the Carabins took a 2-1 lead, Dal faced an important fourth set. The Tigers would emerge with a win, forcing a fifth set for the second time in less than 24 hours. The Tigers would go on to lose in straight sets to CIS No. 4 Laval on Jan. 19. Despite the defeat to the Rouge et Or—still undefeated this season—the weekend saw Dal come away with two important wins. This improves their overall record to 8-5. “It’s a young group but I’ve really been impressed with how they’ve responded to everything we’ve been talking about throughout the year,” said Ota. The Tigers travel to Fredericton to play second-place UNB on Jan. 25 and 26. A lifelong sports fan, Benjamin Blum entered the world of journalism after suffering a concussion playing rugby for the University of King’s College. From that moment, his twin passions for writing and sports motivated the Thornhill, Ont. native to give this journalism thing a try. Having been an athlete, coach and fan for many years, Ben brings his diverse knowledge of sports along with a witty sense of humour to the sports section. Ben was Sports Editor of the Gazette for Volume 146.